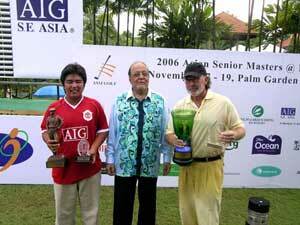 Stewart Ginn Retains ASM Malaysia title in Sudden Death Playoff against Thailand's Amphon Maneerat. Stewart the defending ASM @ Malaysia Champion retained his title at the 2006 ASM Malaysia with a playoff victory over last weeks' ASM @ Singapore Champion Amphon Maneerat. 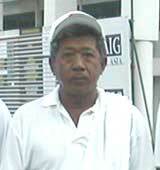 Ginn, a former Champions Tour Major winner who ran fifth on this year’s European Seniors Tour won the 2005 ASM Malaysia on his Asian Seniors Tour debut at Palm Resort Golf & Country Club. With back-to-back victories, Ginn will no doubt be hoping to make this a three in row success at the 2007 ASM Malaysia. In third place was Chang Chin Kuo from Chinese Taipei on 213 followed in fourth place by Eduardo Bagtas Jr from the Philippines. Malaysia’s Nazamuddin Yusof on 215 was tied for fifth with Sutep Boonpimuk from Thailand and Trevor Fisher from South Africa who was playing in the final group. Rounding out the top ten, on two over par 218, were Juanito Pagurusan from the Philippines and Asian Seniors Tour regulars, Masahiro Tokunaga from Japan and Australia’s Trevor Downing. Ginn was happy with the course conditions and grateful that seniors tournaments are now being held on a regular basis in Asia as he has now been based in Malaysia for many years. Leading Malaysian amateur, 15 year old Ilyia Jamil, won the 2006 ASM Malaysia Amateur Championship by one shot over 2005 ASM Malaysia Amateur Champion, Feldman Tan from Singapore after returning a fine score of 74. Ilyia will be invited to defend his title at the 2007 ASM Malaysia and be invited to play in the 2007 ASM Singapore. Unfortunately, the 2003 ASM Singapore Amateur Champion and the Singapore Amateur Open Champion of 2005 retired after only eight holes. The Ladies Championship was won by Ms June Yap from Malaysia who returned sensational back-to-back scores of 77 and 76 whilst playing with the men. The occasion was graced by Tan Sri Elyas Omar, the Sports Commissioner of Malaysia who gave away the prizes to the champions.